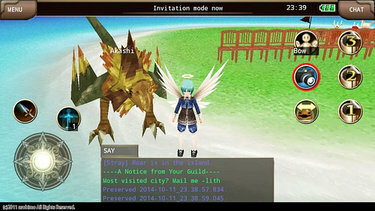 Pets on Iruna Online can be obtained from eggs and from player islands. Pets can help fight alongside the player, heal the player and even pick up items dropped by monsters. Players cannot have their Pets out in battle when they are in a party with other players. A common way to obtain Pets is to place certain items on your island, each type of item attracts a certain type of Pet. After some time a potential Pet will appear and players need to feed it up to a certain point until it officially becomes that player's Pet. If players want a different Pet they can just neglect it and choose not to feed it until a different potential Pet appears.